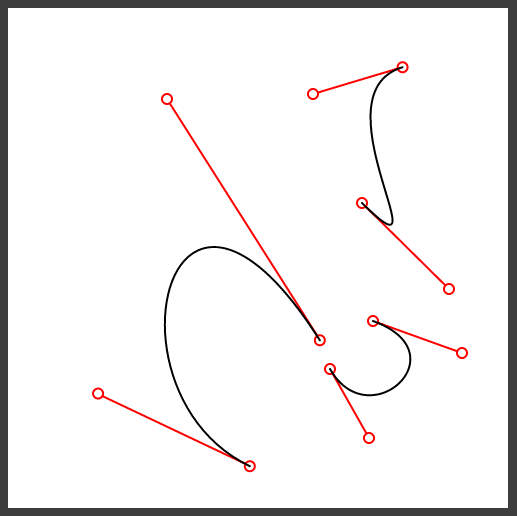 Trying to learn about making some prettier graphs I decided to resurrect an old "drag the anchor and control points of bezier curve" toy I made a while back. The fix was simply renaming the functions to something that didn't collide with the built-in functions. I often say processing.js is a "good 90-95% solution" for translating Java to js, but that remaining 5-10% is pretty confusing to debug! I haven't checked but I'm pretty certain that the most used Google search for this site is "site:kirkdev.blogspot.com boilerplate". Which is what I use when I want to find my basic html5 template in a hurry. I love the idea of p5, though I admit having to remember to prefix every command with "p." (or whatever variable I've assigned) is annoying. I really feel like a better person, empowered and creative and capable, when I take time to sit and hack in an environment I'm fluent in, especially sitting in front of a big monitor rather than just grabbing time on the subway. Between a techie conference, helping friends in need, a band gig, and various social fun stuff, I haven't had a solid morning or afternoon for that for weeks. I wonder if this feeling is anything like what people who get nurtured by being out in nature feel when they go camping. I mean, different, obviously, but deeply resonate and restorative nonetheless. Oh. The other thing: I just realized that for YEARS a gmail filter I set up has been shunting all mail notifications of comments added here away and out of my inbox. I was getting too much material from the "OpenOffice.org" list, so I created a filter for "[dev]'. Turns out that filter wasn't as literal as I had assumed, so something like "[Kirk's UI Dev Blog]", or anything with the word "dev" in it, was shoved away as well. Ah, technology. This past weekend my employer was kind of enough to foot the bill (and I was kind enough to sacrifice a weekend) for the No Fluff Just Stuff conference, 2 1/2 days of lectures on various topics. The emphasis is a bit more Java and fullstack than I try to be these days, but there was still a track for the front end, especially Angular.js and other js toolkits. I'm not quite sure why Web Components feel like the obvious future to me, and the Right Thing, when Angular.js feels like a weird, gratuitously complex set of kludges. I thought "making up our own HTML5-ish syntax" was one of things I hated about Angular, but I guess if you get the syntax and scoping cleaner, it's a pretty cool thing. Still, I don't feel 100% at ease with Angular's "monitoring mapped memory to drive DOM changes" paradigm, its sometimes arcane syntax (oh, inject your dependency by an array consisting of a bunch of strings and ending with the function that does the work!-- though the conference pointed out how this is a pattern of protecting against "uglify" scripts that might try to rename globally shared variables), infamous learning curves, pushing of its own flavors of paradigms (ala factory vs service vs provider), extensive folder structures, etc etc -- or the way that Angular 2.0 promises to bust through some of the unfortunate syntax issues by making all your old code obsolete. wonder what the "halfway point" was for exercises that didn't have a "switch sides" prompt midway through. The only other clever bit was the old "python webserver" trick. Anyway, the 7 Minute Workout is kind of fun. I'm skeptical about it, in some ways, and suspect we don't push ourselves enough while doing it, but still, it's better than nothing, and feels good to get through! Dietzler’s Law for Access: Every Access project will eventually fail because, while 80% of what the user wants is fast and easy to create, and the next 10% is possible with difficulty, ultimately the last 10% is impossible because you can’t get far enough underneath the built-in abstractions, and users always want 100% of what they want. The article cites a brilliant example of "composable systems", how systems that contain of simple, "do one thing, do it well" subsystems chained together are better than monolithic constructs: More Shell Less Egg is where 6 piped together unix commands trumped 10+ pages of beautiful Knuth Pascal for a simple word frequency task. I don't understand this enough to do much with it, but http://wavepot.com/ , where you can make sounds and tracks via math in real time, in the browser, is amazing.